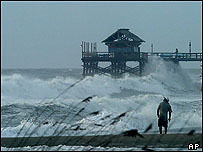 The latest hurricane to ravage the Sunshine State of Florida has left one expat with an unsettling sense of deja-vu. George Robertson-Burnett left his life in Norwich, England, behind in July and moved to Florida to run a B&B inn. Now, just months into his new life, he is enduring his fourth hurricane, Jeanne, having survived Charley, Frances and Ivan. 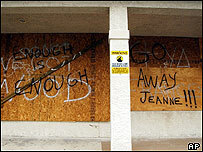 He told BBC News Online: "Hurricane Jeanne probably feels even more scary, because it seems to have come to us rather more quickly than the others. "Also, there is a creeping feeling of complete resigned weariness, which has descended over the local population. "Candidly, people are just plain fed-up with the relentless preparation for, then clear up after, what seems to be an endless stream of hurricanes and tropical storms." Mr Robertson-Burnett spent the early hours of Sunday in the company of local residents who are using his B&B as a refuge. "They are running from the storm, but the running is not a heading for the hills. It is rather a choice of the type of building to see the storm through in. "Our guests have travelled only five miles, but have left behind mobile homes and prefabricated buildings, in favour of more substantial building materials. "To give an analogy, they are running from the house of straw, to the house of sticks - brick is a rather scarce commodity when looking at Florida housing." Speaking on Sunday, he said: "The wind and rain are becoming rather severe, we have already had one power outage, but mercifully there was a quick return to power. "However the cable television has been lost for the last hour, and since that is our main source of information, that is a sad loss indeed. "The preparations today, were more sombre than frantic. Not the mad rush for goods as we have seen in previous situations, more a resigned case of here we go again. "There is a stunned sort of disbelief that this can be happening. Never in living memory, or even in recorded history, has there been a sequence of hurricanes to match what is now happening. "The costs are astounding and what of the perception of Florida - the holiday capital of the world we are told - after such a devastating period of climatic unrest. "The locals just hope that this hurricane season has been a freak of nature which will not be repeated in the foreseeable future, the more pessimistic viewpoint is that this is climatic change, which will be sustained for the next 10 years."